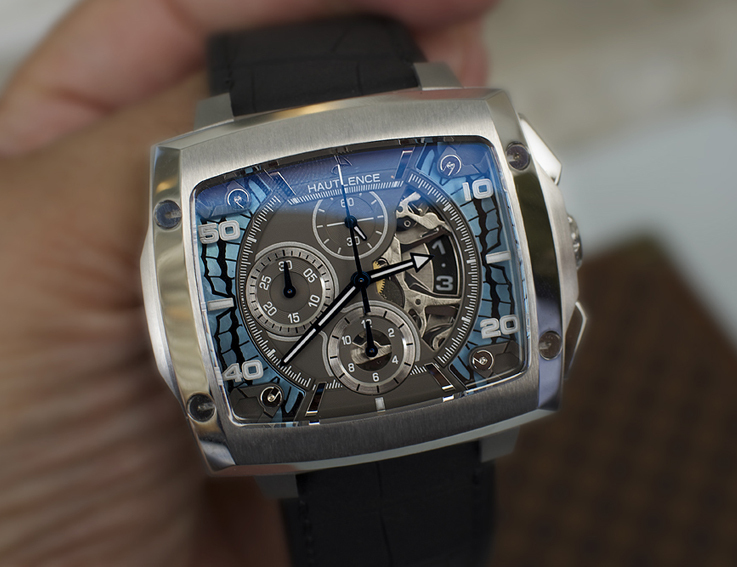 Hautlence launched the ‘Invictus Morphos’ Chronographe, during their 10th Anniversary! 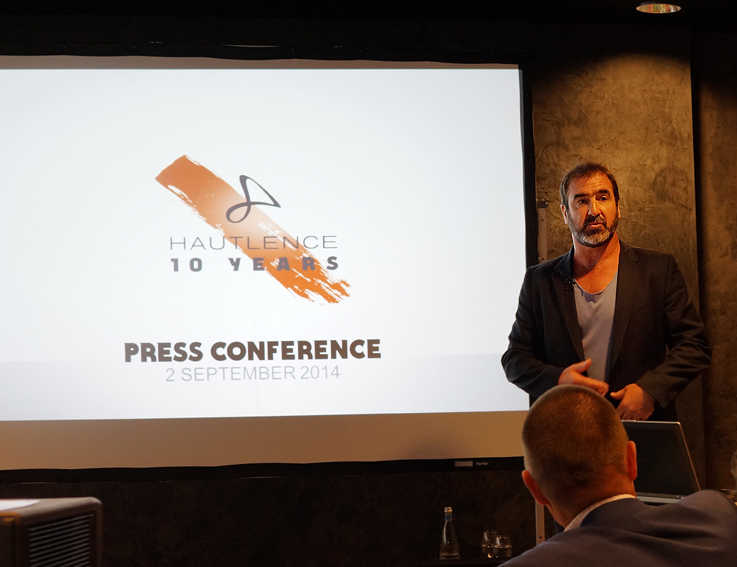 What I thought would be the celebration party for the 10th Anniversary of Hautlence, turned out to be a combination of festivities and the launch of an important new men’s watch, the ‘Invictus Morphos’ Chronograph! 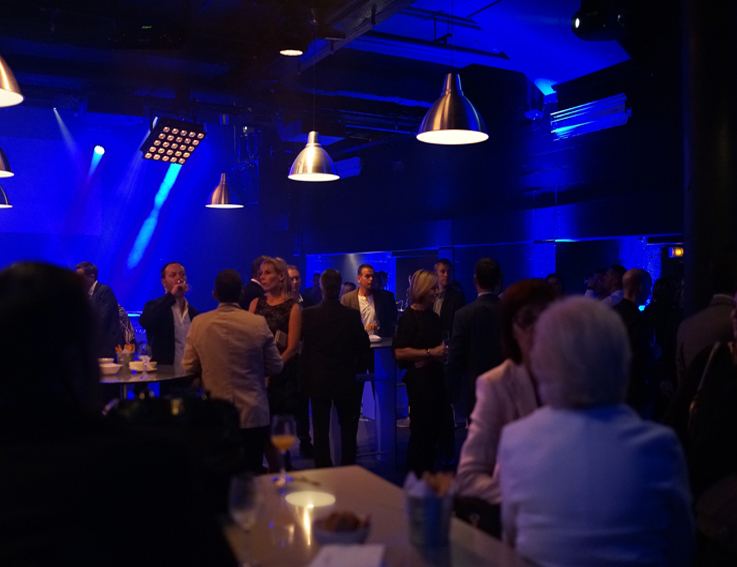 Friends of the House, distributers and Press were invited to come to the edgy “Case à Chocs” night club in Neuchatel, to celebrate the 10th Anniversary of the brand. The evening lasted until far after midnight and it was a lovely event where many could catch up with each other since the last BaselWorld and SIHH. 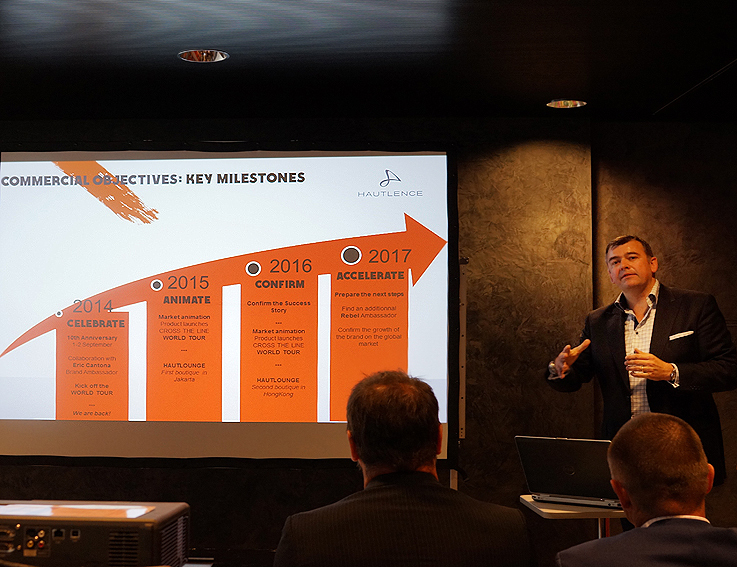 but more importantly updat us with details about the bright vision of the future and the launch of the first Hautlence Boutiques to be opened in Jakarta and Hong Kong in 2015 and 2016. 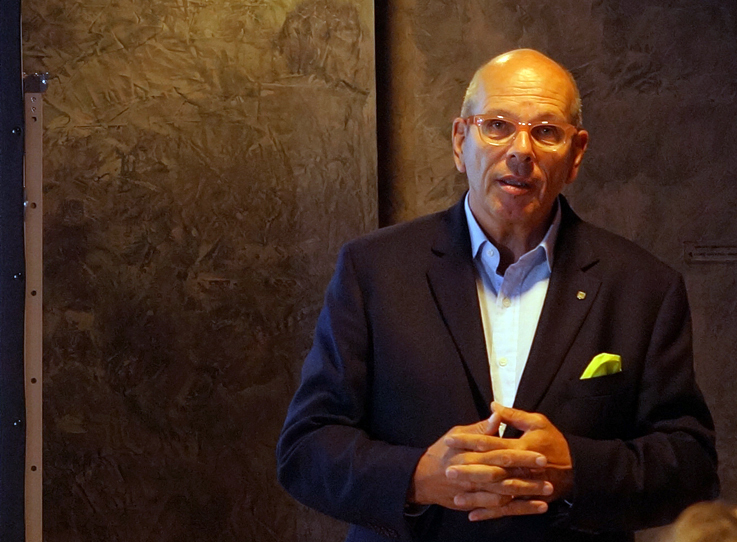 In between the various subjects Guillaume Tetu spoke about, he explained why Hautlence needed a ambassador for the brand. Not somebody that is just a cool face to promote the brand, no it needed to be a famous and good looking man that could work close together with the team, on the development of a new men’s watch. Who better to fit that profile than the French actor, Art Collector and former International footballer for the French National team; Eric Cantona! Then Eric Cantona came on stage and together with Guillaume he did the presentation of the new model, the Hautlence Chronograph that listens to the name ‘Invictus Morphos’. As soon as the watch was presented on the screen, it became clear that this would be another very masculine watch, with the typical Hautlence style horizontal shaped case, a bit inspired by the ‘Avant Garde’ series. The case middle and horns are made in bead blasted grade 2 titanium, while the bezel, push-buttons, crown and screws are in polished steel. 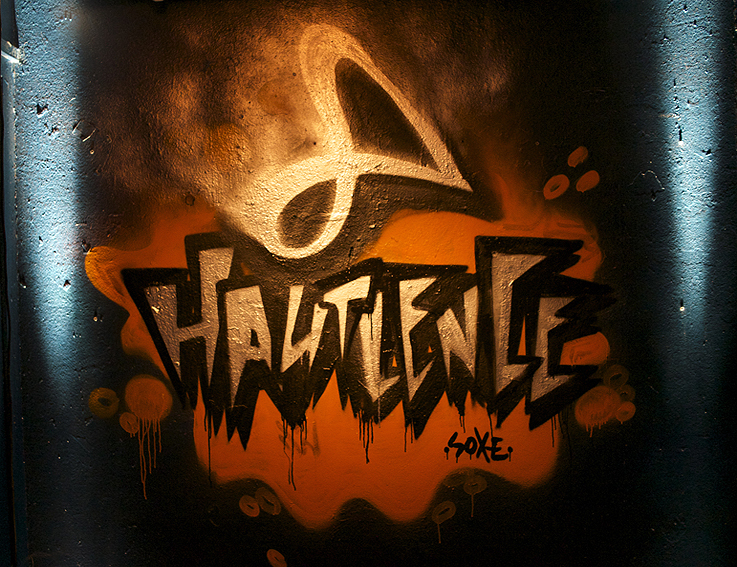 The name HAUTLENCE is engraved in the crown. 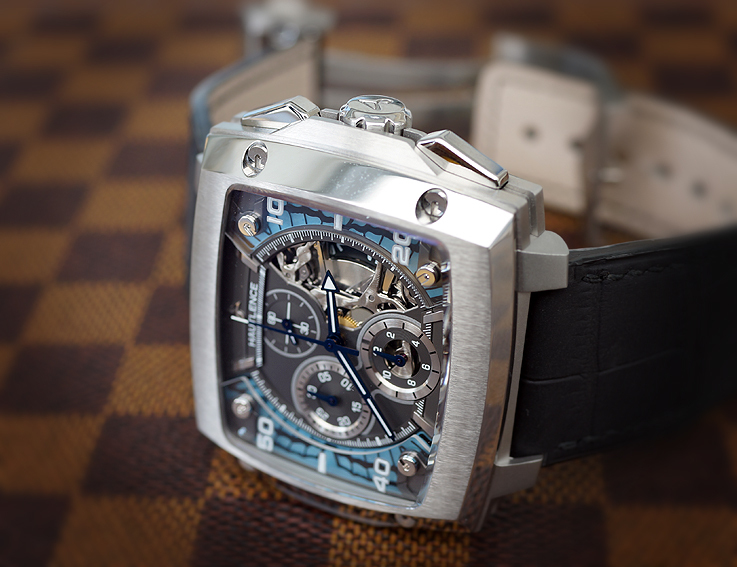 The back of the watch is closed and has “INVICTUS” “Morphos limited edition by Eric Cantona”; engraved, together with Eric Cantona’s fingerprint, his signature and the number of the watch. Just 250 pieces will be produced! Like the new ‘Destination’ series, the movement is not made In House, but Hautlence has chosen to use a skeletonised ‘Dubois Depraz’ Chronograph caliber, built on the well known Soprod A10, as a base. 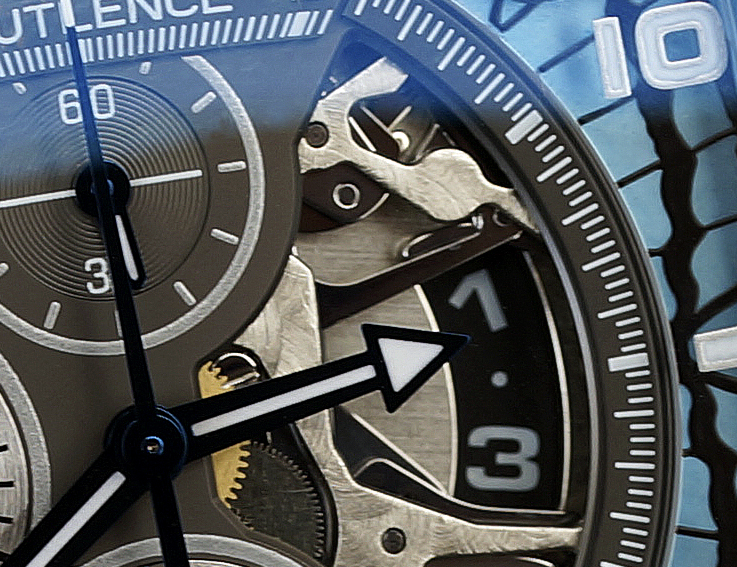 The power reserve of the caliber is 42 hours. Compared to the classic round chronograph watches, the look of this Hautlence Chronograph and the design of the dial are very different. Really eye catching are the details of the wings of a papillon in a bright blue color, on the left and the right side of the dial. For Eric Cantona the butterfly is the very embodiment of the word ephemeral, symbolising freedom, a carefree existence and a zest for life, resulting from the fact that given the shortness of one’s time on earth, one need to enjoy every minute to the fullest. The dial base, in fact is opaline black gold, snailed apertures, rhodium-plated circular satin- finish counter flange and sunburst black gold minutes flange, with blue mother-of- pearl inserts with black print; polished rhodium-plated index and logo; Intermediate dial: sapphire with powered silver-toned print and white SLN; Hours and minutes hands; blue PVD-coated, bevelled and white SLN; The not too eye catching date window is very smartly designed with a black transfer with shiny white numerals. 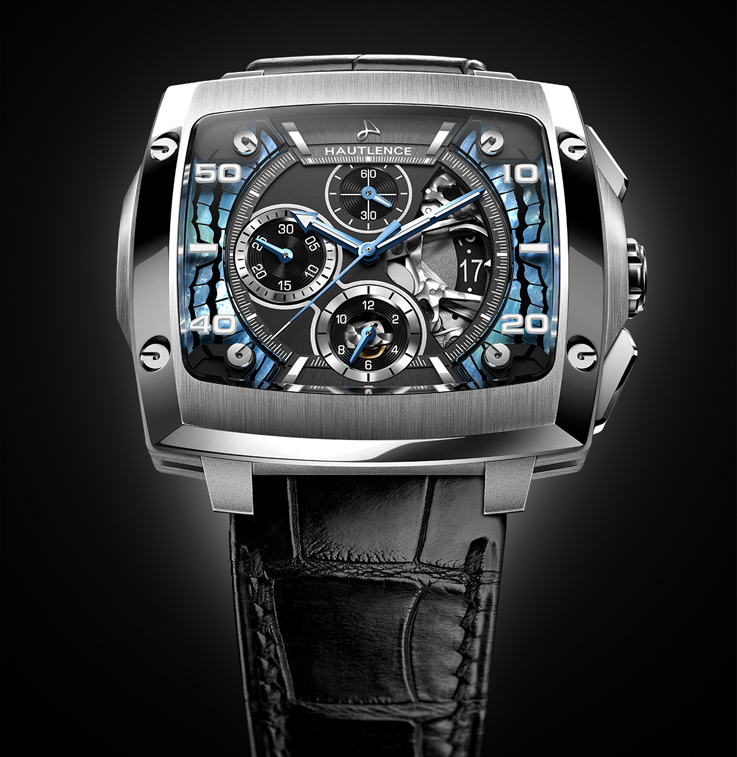 The ‘Invictus Morphos’ chronograph will be delivered, on a satin-finish black Louisiana alligator leather strap with large square scales and a deployant buckle in grade 2 titanium with a polished steel plate.